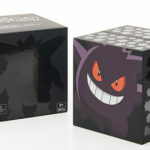 The Pokemon Company has announced it’ll be selling a special Mega Construx Pokemon Gengar set exclusively at Comic-Con. Inside the set you’ll find 367 pieces of Mega Construx blocks. When assembled, players can articulate Gengar’s arms, legs, and ears. Also at the show are life size Mega Construx sculptures of Squirtle, Wartortle, and Blastoise. More details and pictures below. Pokémon fans attending San Diego Comic-Con from July 19–22 are in for a treat: they will be able to purchase a special Mega Construx Pokémon set that’s available only at the show. 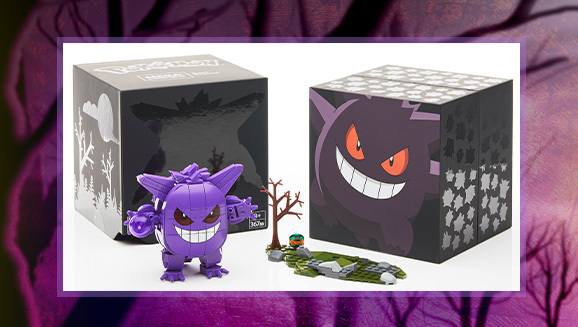 The star of the set is none other than the Ghost- and Poison-type Pokémon Gengar, who looks as spooky as ever in brick form. This 367-piece set allows you to build an intimidating Gengar with articulated arms, legs, and ears, and thanks to its built-in lighting element, Gengar’s eyes glow an eerie red when you press on its face. The set also includes a small base plate complete with a tree and a Dusk Ball. 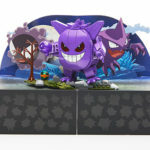 The set comes packaged in an impressive-looking box that opens to reveal pop-up artwork of Gastly and Haunter. The elaborate package also doubles as a display stand for the set, making it an ideal collector’s item. This Mega Construx Pokémon Gengar set will be available for $40 at the Mattel booth (#2945) at the show. When you stop by the Mattel booth, be sure to check out the Mega Construx Pokémon displays decorating the area. A large brick-built diorama will contain all the Mega Construx Pokémon figures that have been released so far. You can also see a massive Mega Construx sculpture featuring “life size” models of Squirtle, Wartortle, and Blastoise. The Blastoise model is about 6 feet tall (including the base), so it should make for a memorable photo op at the convention. Even if you can’t make it to San Diego Comic-Con this year, the sculpture of Squirtle and company will be making another appearance at the 2018 Pokémon World Championships in Nashville, Tennessee, from August 24–26, so you’ll have another opportunity to check out this amazing display!